Listen to the "Saint of the Day." Read the story of Saint George on page 12 of Saints Lives & Illuminations. Read the story about Saint George on page 34 of Picture Book of Saints. 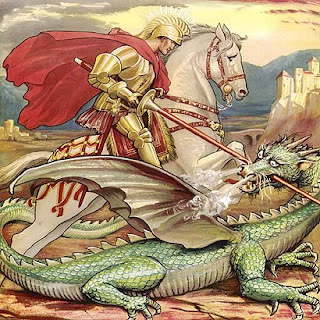 Read and discuss St. George and the Dragon. Color a picture of St. George from Fenestrae Fidei. Online coloring pages can be found here, but my favorite is the one from CHC. Make a Sock Puppet Dragon. Paint a St. George Wooden Saint. Women for Faith and Family shares a couple ideas from Joanna Bogle for setting the table as well as a recipe for Trifle for Saint George's Day. You can find more a few more ideas over at Catholic Cuisine! We will probably be having English Fish and Chips for dinner once again. Here's a picture of our dragon cake from last year. You can see all the awesome dragon cakes made by others, as well as additional directions from Charlotte, here. I used up all of the red food coloring on Chiquita's ladybug cake... So his spikes and flames look like Mustard. ewww... I didn't have Hershey kisses either, so I used Junior Mints for eyes/nose. I am sure my boys will also be pulling out their swords and armor to reenact St. George and the Dragon once again this year, and most likely all their Playmobil toys too! Happy Feast of St. George! This is such a great idea! My kids are too young but I know once they really start understanding things a lot better I will definitely do things like this..What a great idea!!! Great ideas! Thanks for sharing. I linked to you in my post for today too. Happy Feast of ST. George!! !